Garlic and ginger are two herbs that possess many little-known therapeutic uses and health benefits, alongside their more common uses in the kitchen. Both of these herbs have been studied for their effectiveness in fighting infections, preventing cancer and reducing inflammation and various other applications. Garlic is thought to have antifungal, antiviral and antibacterial properties. It can be applied to the skin to treat fungal infections such as ringworm, jock itch and athlete's foot. The University of Maryland Medical Center notes that it was also used on wounds during both world wars to prevent infection. According to a 2010 study published in the “Journal of Microbiology and Antimicrobials,” ginger proved to have a higher antibacterial power than three conventional antibiotics against two strains of staph infection common in hospitals. Both garlic and ginger are thought to have anti-inflammatory properties. Ginger is sometimes used to treat arthritis, a disease characterized by inflammation. A 2013 study published in “Food and Chemical Toxicology” showed allicin, the active substance in garlic, to be a potentially effective treatment for chronic inflammatory disease. The National Cancer Institute notes that garlic may work to prevent cancer in several ways. Those include its antibacterial properties, its power to stop cancer-causing substances from forming and its ability to promote DNA repair. The American Cancer Society notes that garlic's allyl sulfur compounds likely play the most important role in garlic's anti-cancer properties. Garlic may also promote cancer cell death through a process called apoptosis. While garlic may be useful in preventing cancer, human studies on garlic have not shown it to be helpful in treating cancer. Ginger has long been used for for its herbal properties, which are especially helpful in easing upset stomach and motion sickness. This herb has been shown to be particularly effective in controlling nausea and vomiting in both cancer patients undergoing treatment and pregnant women. It is hypothesized to work by changing serotonin receptors in the digestive tract. The University of Maryland Medical Center notes that garlic may help prevent heart disease by lowering blood pressure and slowing the hardening of the arteries. According to medical center, garlic can also play the role of a blood thinner, which makes it a useful tool in the prevention of heart attacks and strokes. Consult your doctor before considering it for this use. 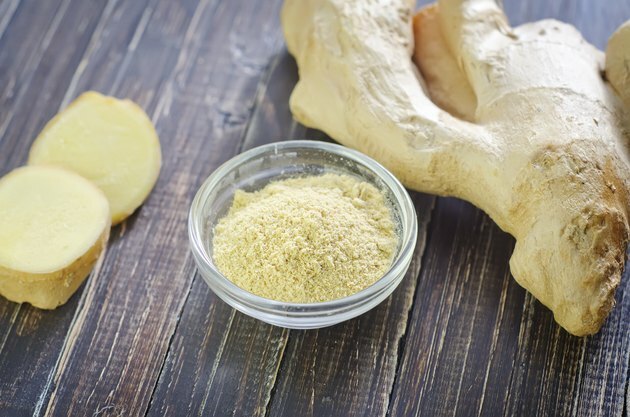 Ginger appears to work about as well as ibuprofen for menstrual pain, according to one 2009 study published in the “Journal of Alternative and Complementary Medicine.” The study showed that 250 milligrams of a specific ginger extract taken four times a day for three days at the start of menstruation alleviated pain in up to 62 percent of women in the study. Garlic may have the ability to help prevent the common cold, according to one 2001 study published in “Advances in Therapy.” The study found that over 12 weeks, participants who took one capsule of an allicin containing supplement were much less likely to contract a cold virus.